Peter and Andi were driven by a strong sense of place and purpose and to reintroduce food from the heart, recipes from his mother, Sue Fine former chef and owner of Westport’s Soup’s On. The result is a restaurant that embraces everything from date nights to family dinners and special events. The restaurant’s concept focuses on health and happiness offering traditional comfort foods we crave and love, salads that burst with freshness, creativity and flavor and new and innovative dishes for those with more adventurous palates. To best execute this the Fines turned to Chef Kevin Garcia who now commands the helm of the Milestone kitchen with carte blanche to bring a bold flavor palate to the next level. Chef Garcia, a graduate of Johnson & Wales University, brings his expertise from such esteemed New York restaurants as George Vongerichten’s Prime Steakhouse, Drew Nierporent’s Lucca, Mario Batali’s Del Posto and Giovanni Rana. 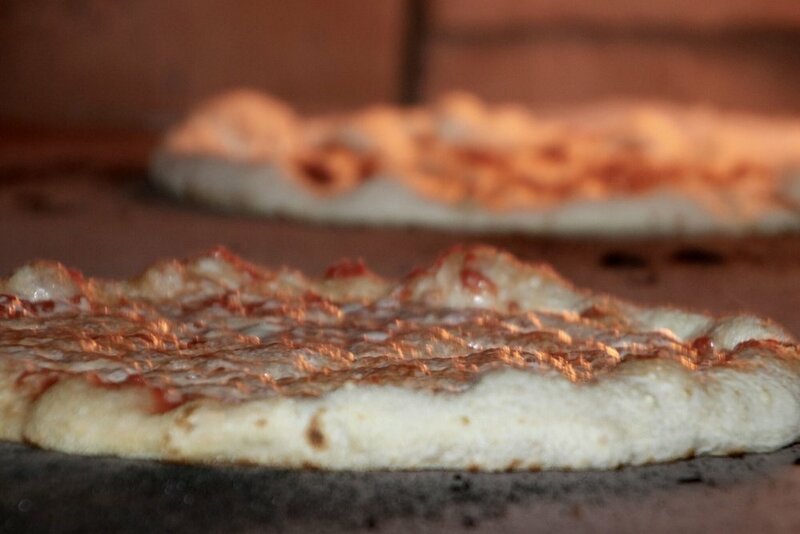 While not a traditional pizzeria, if it is pizza you crave you will not be disappointed. Imported from Rome, the wood burning oven was the first I have ever seen with its rotating turntable. Three exquisite pizzas were retrieved and presented to me. I sampled the Salad Pie, arugula, caramelized onion and a divine vinaigrette. I’m not normally a fan of the “salad” varieties, but this more than some lettuce tossed upon some dough. 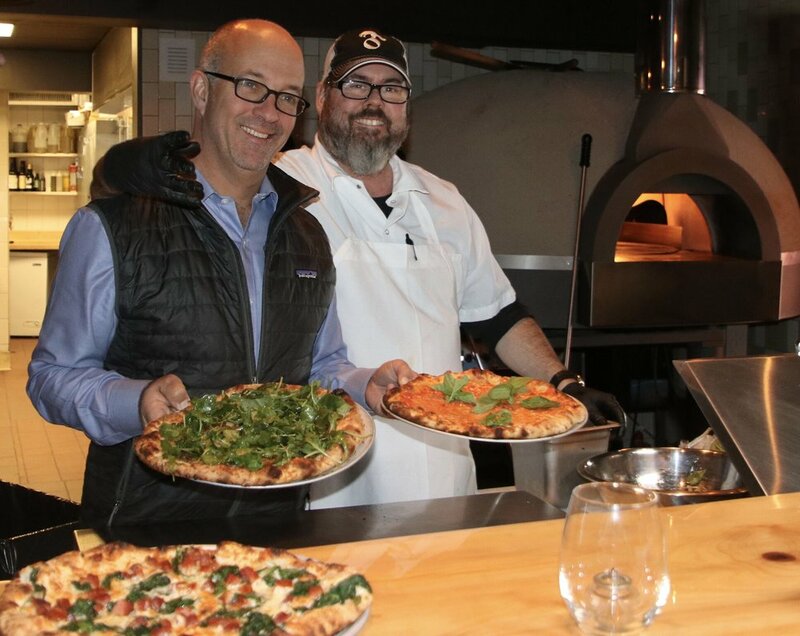 The flavors were complex and bold yet the pie was light by traditional pizza standards. One can never go wrong with Cheese, the classic pizza, but it was indeed Popeye that stole my heart! Spinach, Pancetta and Garlic partner up perfectly in this delicious pie. A local gathering place isn’t homey without its comfort food. 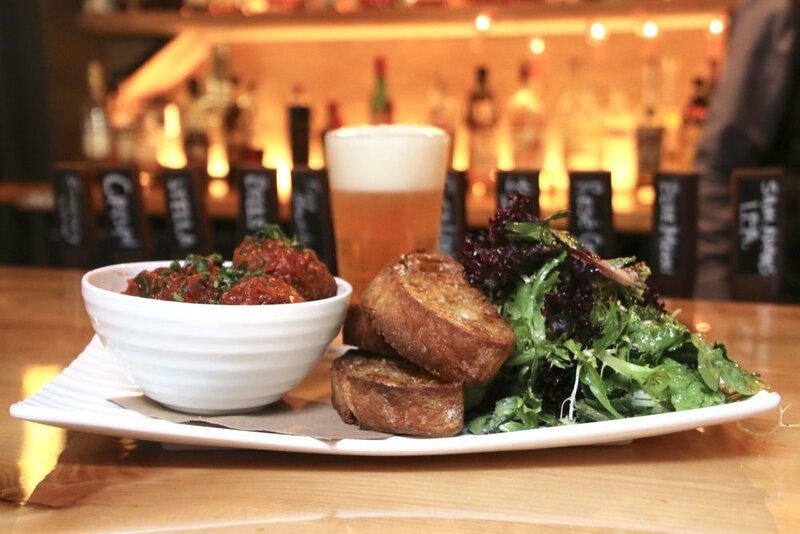 Start out with a soul warming cup of Butternut Squash Soup with toasted pumpkin seeds, Balls – melt in your mouth meatballs that were adapted from a family recipe, and a divine and hearty Grilled Sausage with mustard and pickles that are house-made or Milestones own Hot Wings and Ranch, a twist on the tried and true. You want a burger? Yeah, they’ve got that too. I asked Peter about the inspiration behind the name Milestone. “Milestones aren’t just limited to life’s bigger events. They can be something as simple as getting together with a friend for a glass of wine or a meal, that these all should be celebrated.” And at the restaurant they indeed are. You’ll need something to wash down your wings. Perhaps one of the many offered craft beers from local and east coast breweries? Or a reasonably priced wine? 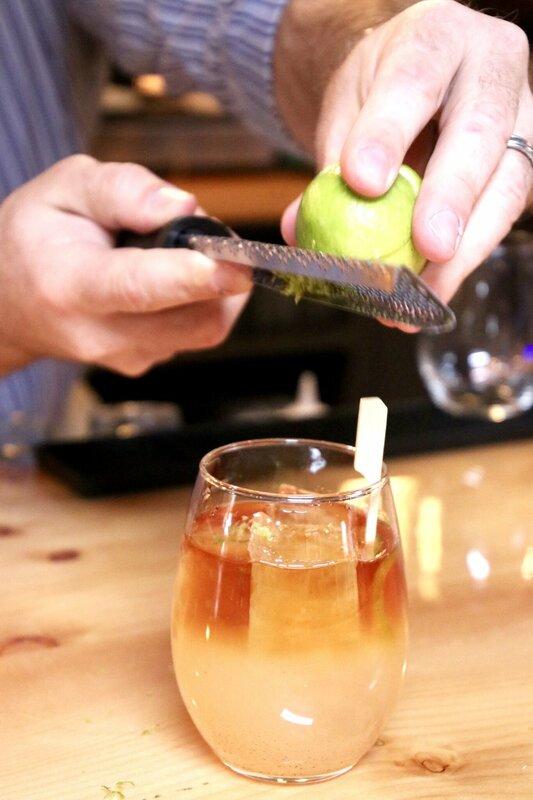 Or maybe you’d prefer one of the fun and festive craft cocktails made from freshly squeezed juices and local ingredients? Those seeking lighter fare, an assortment of delicious salads from Mixed Greens, Salade Nicoise, Endive, Caesar to the Escarole await hungry, health-conscious diners. Made with chopped toasted hazelnuts, red onion, mint, Pecorino and a Sherry vinaigrette, the Escarole Salad might very well be one of my most favorite to date. I’d return for the Popeye and Escarole alone… but I then I’d miss out on the many fabulous offerings from the entrees. 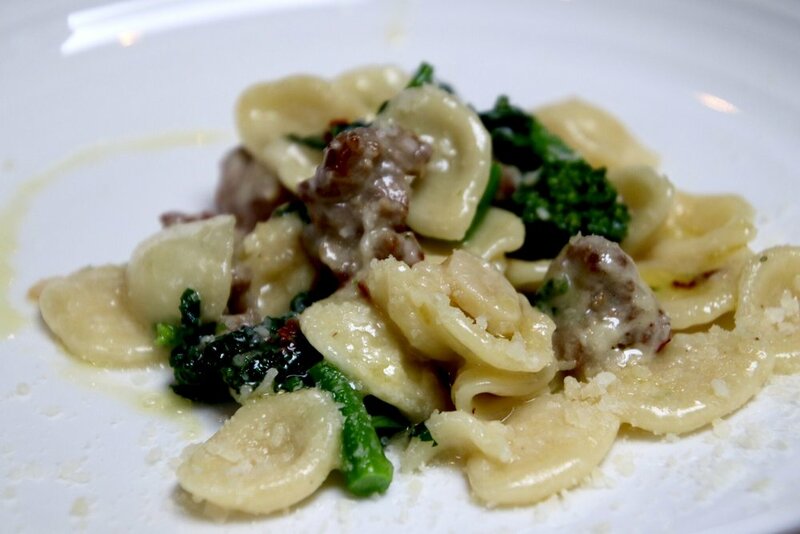 Pasta lovers will not want to miss the Orecchiette with broccoli rabe, pork sausage, garlic and ricotta salata. 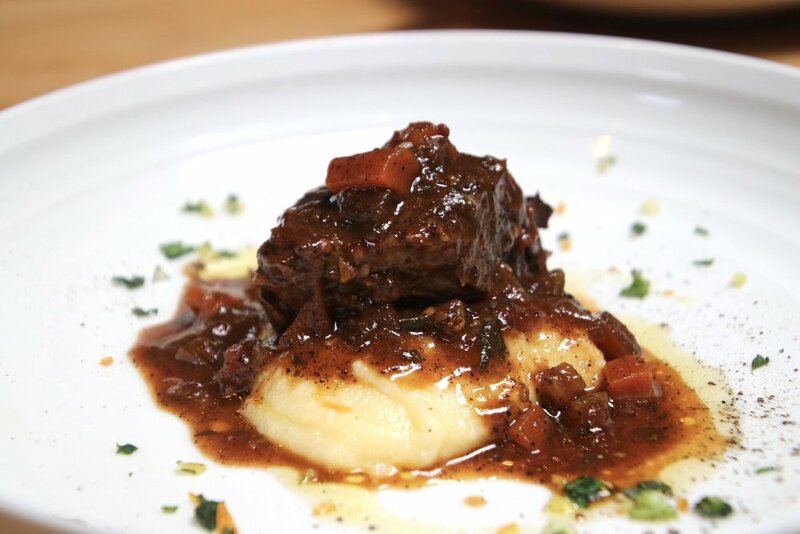 The Beer Braised Short Ribs with roasted carrots and soft polenta are rich, deeply intense, and comfort to extreme. The meat couldn’t have been any more tender. The Scallops, seared to a crispy perfection with a crust-like exterior yield to a soft, melty center served with capers, sultanas and pancetta to offer a mildly sweet and savory flavor. With easy access nearby Wilton, Easton and Redding, as well as from Fairfield, Westport, and Norwalk, Milestones will be the neighborhood meeting place to many. Milestone is open Tuesday through Thursday from 5:00 – 10:00 PM; from 4:00 – 11:00 PM on Fridays, 11:30 AM – 11:00 PM on Saturdays and 11:30 AM– 9:00 PM on Sundays.